Locality: United States, Colorado, Hinsdale, Southern Gunnison Basin: San Juan Mountains: on west side of County Road 34, ca 0.2 road mi N of intersection with County Road 30; ca 1.4 air mi NNW of Handies Peak; ca 13 air mi SW of Lake City. Habitat: Steep north- and east-facing alpine slopes with intermittent open spruce forest at the lower elevation. Elevational range: 11400-12680 ft. 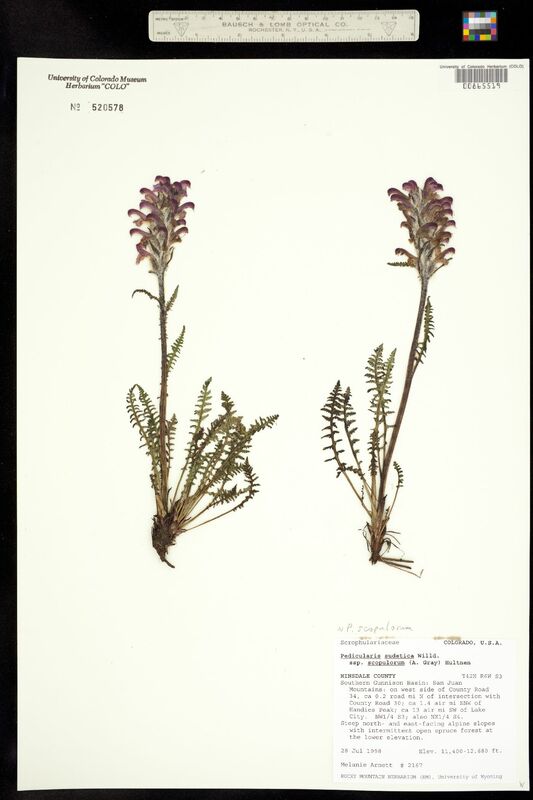 Occurrence Remarks: Originally ID'd as Pedicularis sudetica Willd. ssp. 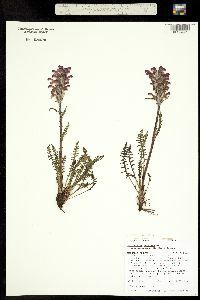 scopulorum (A. Gray) Hulten. Additional TRS: SEC4 NE¼.